Schools in Virginia state in the US are running on solar power and are benefiting from huge saving on their electricity bills. Any excess power that is generated can also be sold to the grid. 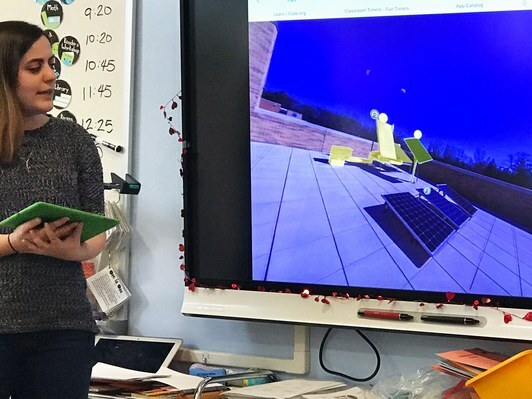 These schools have gone an extra mile in not only utilizing solar energy to go green but are also educating their students about solar power in a live and interactive way. These students can easily scroll their computers/ tablets to check the school’s energy generation as well as consumption. They can also track the sun’s movement and notice the difference on a less sunny or cloudy day. Buy a Solar Toy For your kid this Summer!! Colorful graphs and pie charts are used to make the learning more interesting for the kids. Children then make groups for discussion about the outcome and their day’s learnings. Different sets of data are used to discuss energy used for different purposes like lighting or heating. The school also houses a large-screen energy dashboard for the children to see. Solar panels and inverters are also prominently displayed for the little inquisitive minds. What an interesting way to teach the future generation about energy sustainability and conservation! students also learn mathematics concepts of averaging, fractioning etc. with the help of these charts and data. The government schools are facing financial challenges as the cost of installing solar panels is high for them, given a majority of their students belong to low-income households. We need more such schools in all parts of the world to educate our future generation about a green and sustainable lifestyle. It is important to inculcate these lessons right from an early stage so that it becomes a part of their lives while growing up. Price of going solar is falling and it is slowly becoming mainstream. It is high time that curriculum is modified to include chapters and interactive sessions in this direction, for developing minds of the nations who are poised to become the future generation!